It is official: after a full two days in Tokyo, I am the world’s foremost expert on the place, and am happy to pronounce unimpeachable judgement. OK, maybe not, but I’ve enough under my belt to give a first impression its best shot. We spent another day in the charming company of Shoko, our guide. It proved again how valuable having such help can be: with none of the language (written or spoken), she has been able to make sense of things and also add a little context. Indeed on one occasion she came to the rescue of another foreign party as they grappled with the conventions of our sushi bar (more on that later). Today we went to the gorgeous Hamarikyu Japanese Gardens, saw the amazing Meiji Shrine, took on the panoramic views of the city from the City View at Roppongi Hills and then onto two extraordinary shopping experiences at Takeshitadori Street and the Akihabara District. The Japanese Gardens were serene: built as a respite for a Shogon from his 3,000 concubines (! ), it represents a magnificent Japanese version of a chap’s garden shed. They don’t do synchronicity or many flowers, but it was restful, airy and shady. We even had traditional tea sitting on what appeared to be judo mats – cue much giggling from my wife as I tried to sit crosslegged for more than a few seconds. Cue also resolution to take up yoga. The view from Roppongi Hills was truly staggering, and it brought home my first firm conclusion of the day: Tokyo is massive. One tends to think of this city as a dry, financial place that is suffering from a lost economic decade. Not a bit of it. It is one teeming, compliant, happy place. We had lunch at a sushi bar for locals, which was delicious. Not one to separate myself too often from steak and chips, I let more of the slippery little fellas from nearby Tokyo Bay slip down my gullet in one hour than would usually be the case in a month. Conclusion number two: it is the most local global city I have ever been to. For whatever reason there are astonishing few foreigners here, allowing you instant immersion in this vibrant world. Maybe it’s the images of Alec Guinness blowing up railways bridges etc, but the Japanese have perhaps a reputation for efficiency, shall we say, not hospitality or colour. How wrong we are. Conclusion number three: don’t believe a word of a consumer drought. Whilst financial commentators will rightly concentrate on things that change and focus on whether Shinzo Abe can “pull Japan out of the mire and get them spending again” it sometimes masks perhaps greater truths about the things that stay the same. We went to down Takeshitadori Street (pictured) which can best be described as one long teenage girl’s bedroom (I know, I have two), full of (mostly) girls getting excited over the most extraordinary glittery, feathery pap. Most of them were also wearing said pap, looking like weird living dolls: I will never pass comment on my daughters’ sartorial standards ever again. In the Akihabara District there are over 500 gadget shops. I know. I nearly passed out with excitement. Having been given a stern marital limitation of one shop, Shoko takes me diplomatically to the biggest: think Hamleys, Boots and PC World (x6) together under one roof, on 8 floors. We go to the gaming section, where Son picks his way through various versions of killing games (a nono in our house), whilst Wife takes refuge, perching on the edge of a table between two boys playing power rangers. There must have been hundreds of shoppers in this one store, and the noise is deafening. 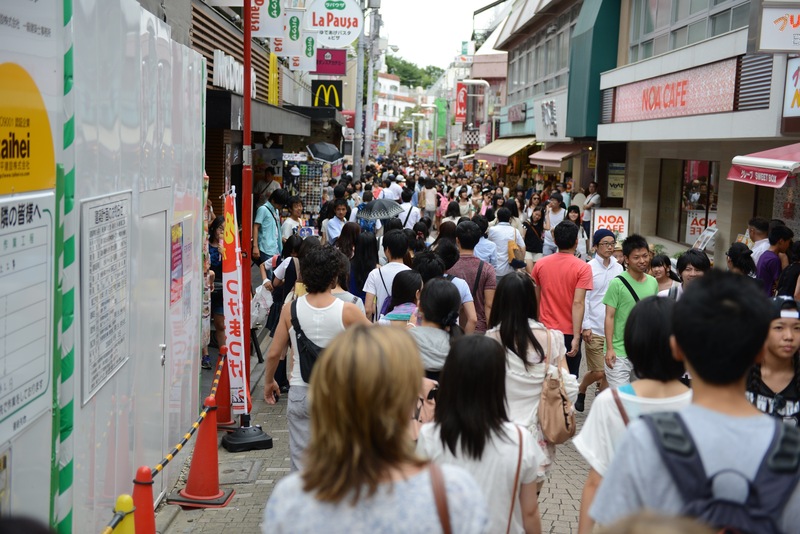 Conclusion number three: Tokyoans love their shopping. We are off to the country to see more of this extraordinary place tomorrow, staying in traditional ryokans, the equivalent of the country pub except with judo mats. Hmm. Will report back.